The over-populated, you’ll regret this, you’ll regret that lists and videos that you find on the web are intriguing, to say the least. Interesting because there is apparently a deep fear amongst enough people to provide such content. People have a fear to not live their lives to the fullest, whatever that may mean. 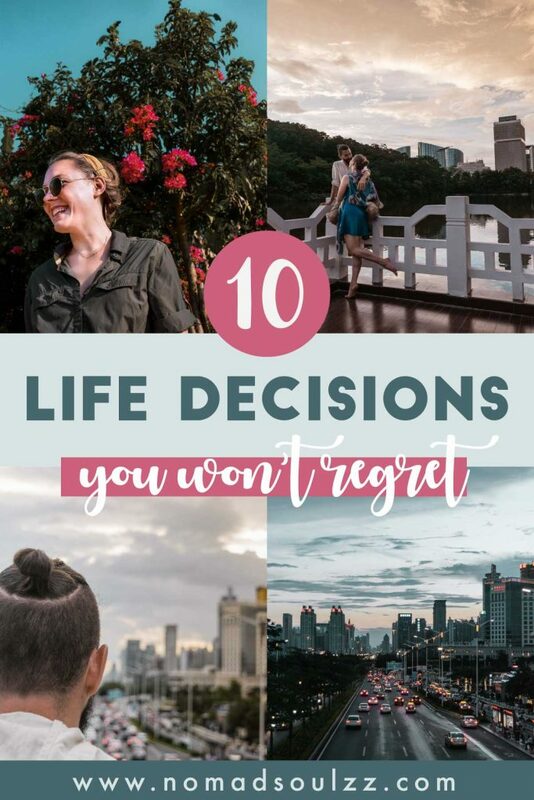 Recognizing the fear, we flipped the coin… and listed life decisions we believe you won’t regret making. 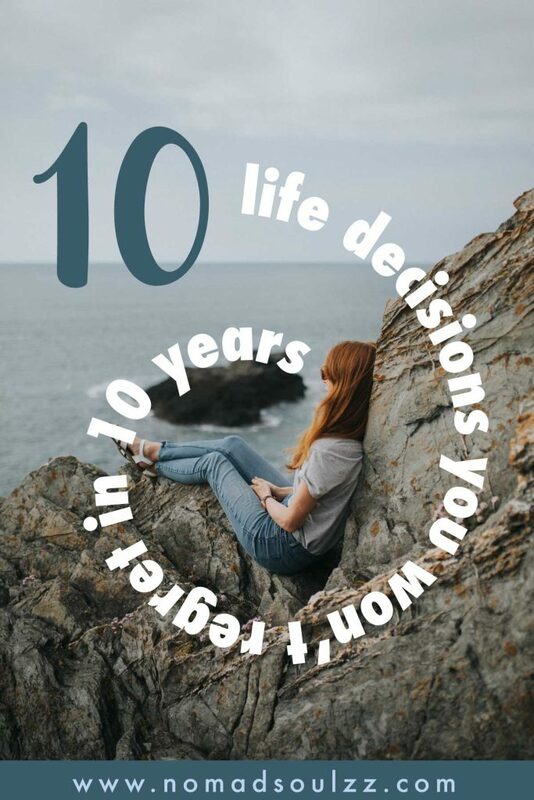 Life decisions aren’t about the cupcake you did or didn’t eat. It’s about life on a much grander scale. Concerning your values and thoughts on life’s more complicated questions. 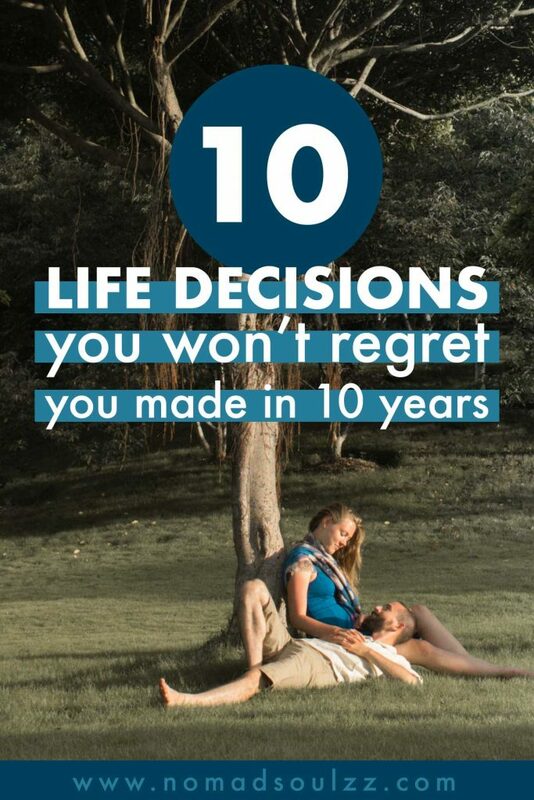 Here a list of 10 life decisions you can make today, that you won’t regret you made in 10, or 100 years. Will it be easy? No, it will for sure require discipline. 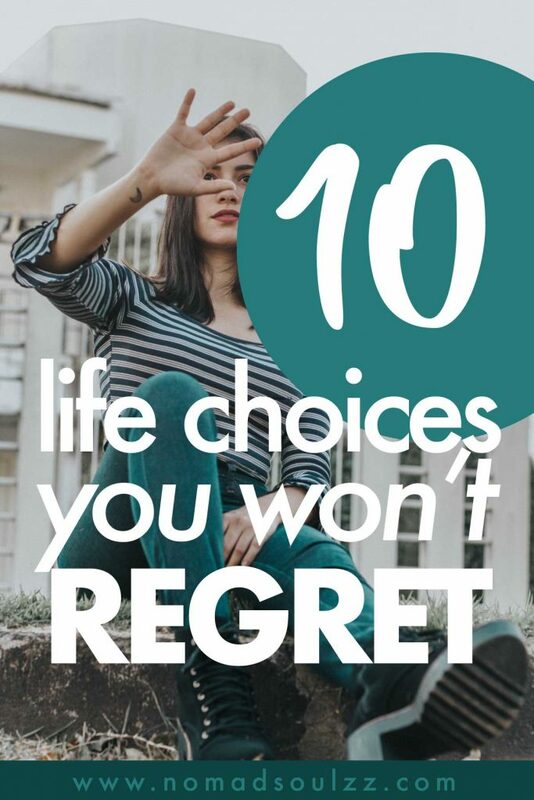 But like Jim Rohn so wisely phrases: We must all suffer one of two things: the pain of discipline or the pain of regret or disappointment. If you were lucky enough as a young kid to have loving parents or caretakers look into your eyes and tell you that you are unique and special and you should never let other people tell you differently you had a blessed kickoff. If you didn’t, well, please take these words as truth. You have something to offer nobody else can offer. Nobody has exactly your personality or your gifts. You are more than average, you are one of a kind. A never before and a never again. Living your life with a mask is not only tiring, you’re not really living. Truly and fully embracing life is only possible if you lovingly embrace and express your true self, with all its beautiful imperfections and quirkiness. 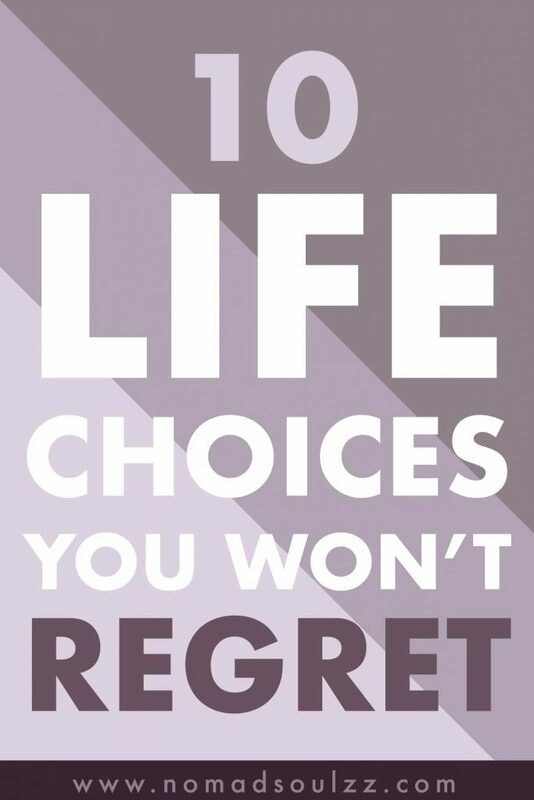 Challenge yourself to fully accept yourself as you are and you’ll make a life decision you won’t regret. Your body is the temple you live in during this life. Don’t take it’s health and well-being for granted, treat it with respect. A lot of people take their good health for granted until they get sick, and what a shame. Like it or not, quality of life is very closely related to your physical well-being. So be wise and take care of the full package before it’s too late. Prioritizing your health by actively and mindfully choosing to take care of your body by implementing all forms of self-care on a regular basis will be another one of those life decisions you guaranteed to not regret. Need some self-care inspiration? Check out this link here! In the introduction, we mentioned it already, prepare yourself for the pain of either discipline or the pain of regret and disappointment. That voice within that doesn’t use words but gives a clear direction, listen to that. The already paved path is easy, fast and convenient, but not necessarily the most satisfying and pretty one. Deliberately choosing the off beaten path requires heaps of discipline but will reward you in ways your heart will forever be grateful for. Whatever others – how close they are to you – tell you, you are the captain of your life and you ultimately decide which course your ship is sailing. We’re sorry (not sorry), but if it’s time to pop your bubble, its time. Being a control freak is not going to help you in life. You might feel that being able to grasp and control everything surrounding you is something virtuous but in reality, you are wasting your precious energy on something impossible. Besides the fact that its impossible to control everything, life really would be tasteless if you could. No surprises and no challenges, how dull! Ease up and trust the path that life has to offer. When the control mania hits you, take five. Take a couple of deep breaths, reconnect with the moment and send trust to yourself and the people involved. Allow yourself to be surprised and rather embrace the odds than reject (and try to control) them. 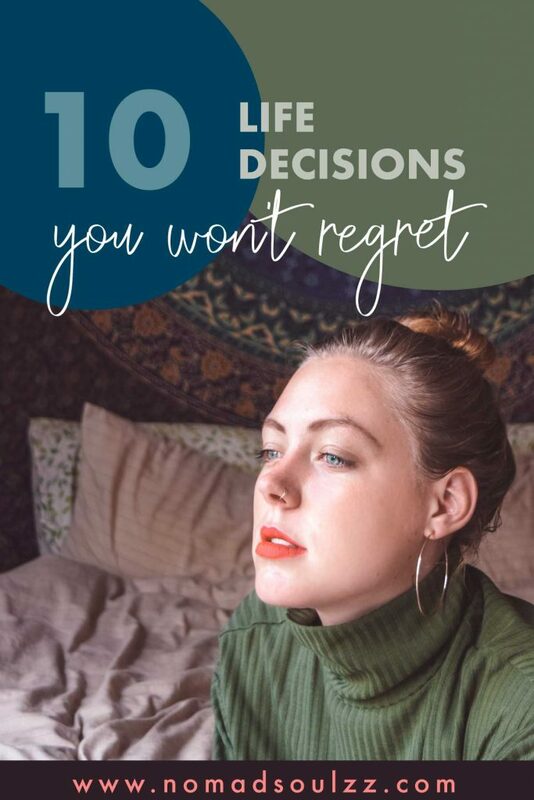 This article is all about life decisions and things you can choose to change for a more positive life. For some people, judgment is like the steering wheel of their life, and this is going to be something they will regret at one point or another. A judging mind is a narrow mind. The more judgment you show towards others, the fewer other people around you will feel comfortable being themselves. And like vicious circles flow, it ain’t pretty. Practice and embrace accepting things, events, people and yourself as they/you are. Observe the peace, freedom and love this releases. Life will not only be easier, it will be more open and it will flow like it should. Being aware and mindfully practicing to silence that judging voice will be a life decision you won’t regret. 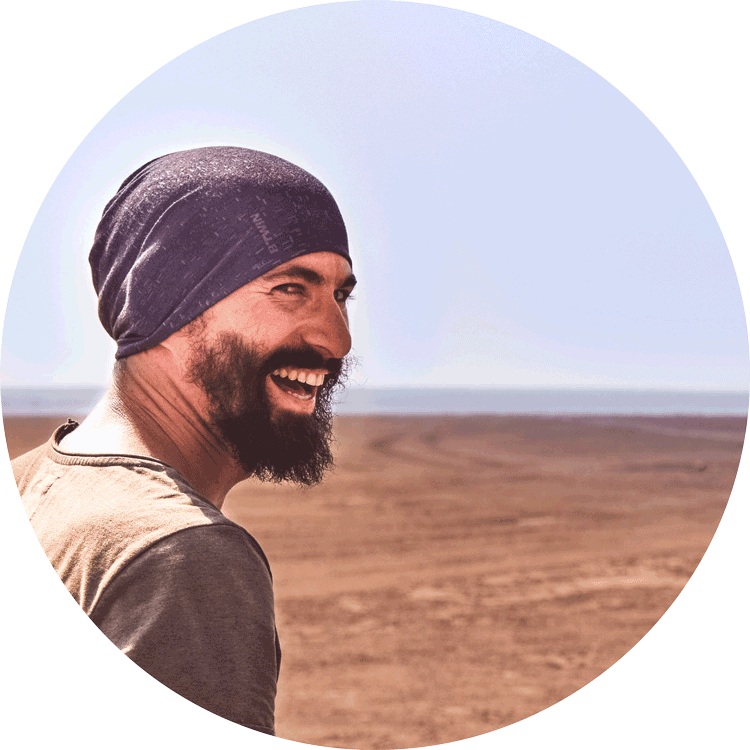 The peaceful warrior a book by Dan Millman portrays three very easy questions, with three much more important answers. Avoid living either in the past or in the future. Life is every given moment, encourage yourself to embrace that, for that is truly what life is. The past and future only exist in your thoughts, they are memories or projections that simply don’t exist. 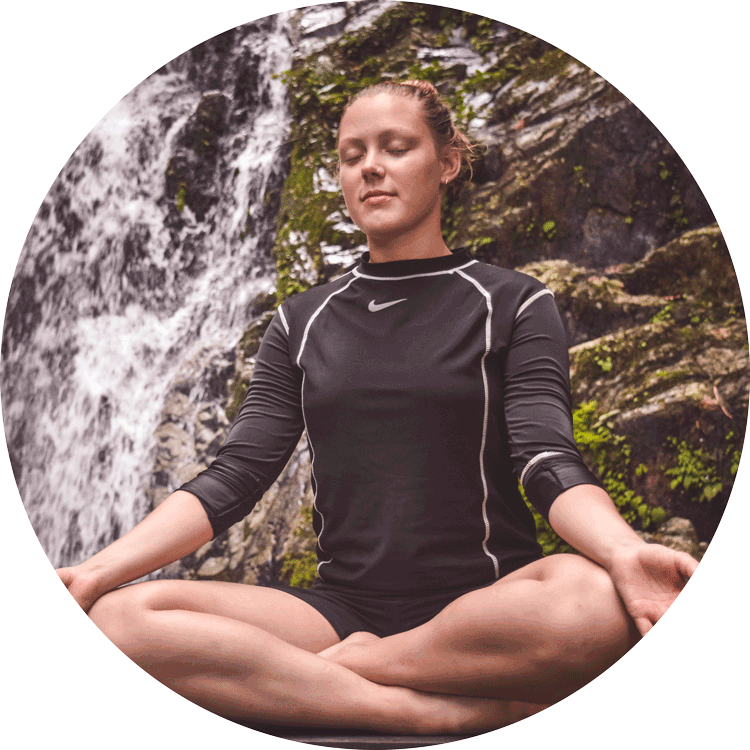 Mindfulness is a wonderful tool to make the fullest of the moment, to really experience life as it presents itself. It inspires to utilize our senses on deeper layers, to enjoy what is given to us in that very moment. Ultimately it slows down the pace of life, to a pace that makes life more clear, more enjoyable and less frantic. Win-win-win if you ask us. Everything has hidden beauty. Everything, everyone, everywhere. Choosing to appreciate the ugly and recognizing the beauty everywhere we go will make the world a much more beautiful place to be. You’ll learn to enjoy the whole spectrum life has to offer. Life is packed with dualities. Acknowledging this as a balance rather than merely something you have to accept brings more understanding. Recognizing how something worn-out adds character, or something sad is from a source of pure and honest love are just examples how appreciating the so-called ugly will make life not only more bearable but way more delightful. Doing something like a happiness challenge is also a great way to help you shift that perspective! Of course, money is to a certain extent important to get around, to pay the bills and to enjoy certain aspects of life. But it seems that too many people nowadays rely on money as their ultimate happy maker. If I have that new phone… then man, I’m gonna live the life. But when they have the phone, the next big thing pops up. 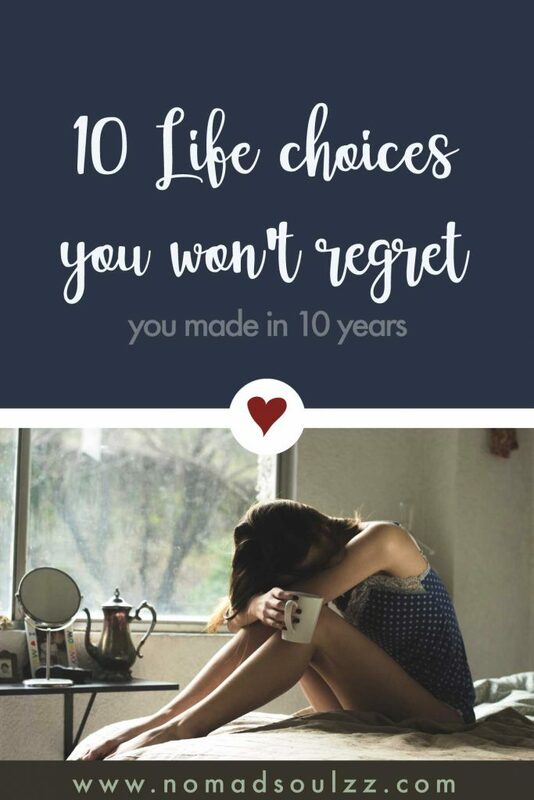 Not spending all your money would definitely be one of those life decisions you wouldn’t regret in 10 years. Because in that time you will create a buffer that will give you peace of mind and freedom. You will appreciate less and understand that true happiness doesn’t lie in things but elsewhere. Related: How to do a digital detox! I have a very wise (and beyond amazing) mother, any time she spots even a glitch of any of my stress symptoms (skin rash, a stiff neck, bad sleep etc.) she stops whatever she’s doing to sit down with me and help me put things in perspective. Why? Because she knows how poisonous stress can be. Within an instant, it can take over your life and cloud your otherwise oh-so-clear thoughts. 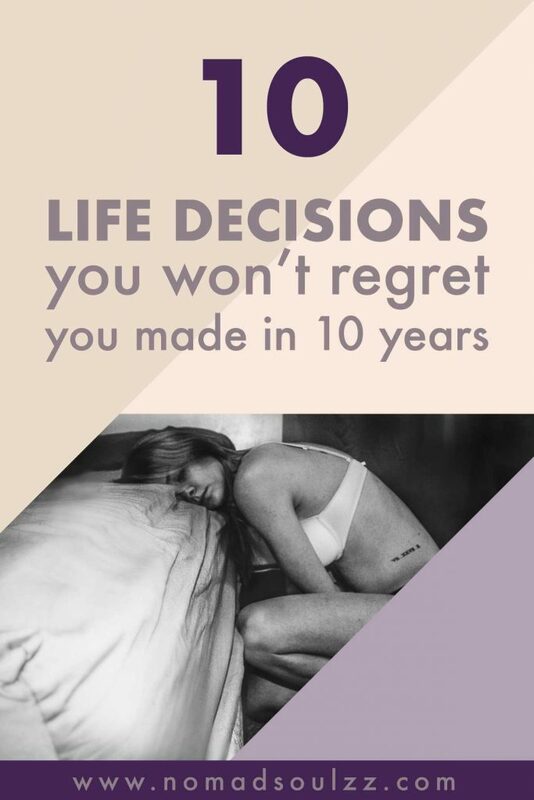 Taking enough time to really reflect on the decisions you make is key here. Be honest with yourself and listen to your gut feeling when it shouts noooooo!! Does [X] make you happy? Does [X] make you stressed? And then finally, cut yourself some slack and put some things into perspective. Look at the situation from a different angle and be open towards all outcomes. How much stress does this bring along? Often people fall into the trap of wanting to change people because it has helped them. How good and pure your intentions might be, you can hand them the key but they themselves need to open the door. Of course, inspire people to live a meaningful and happy life and give advice if people ask for it but don’t be disappointed if people don’t change because you want them to. It can be extremely difficult to see people close to you suffer, but your solutions might not always be the best for them. Support them when and where you feel you can, but most importantly, be the example. Don’t drown yourself in their lifestyle or choices, make time for your personal me-time by taking self-care seriously. 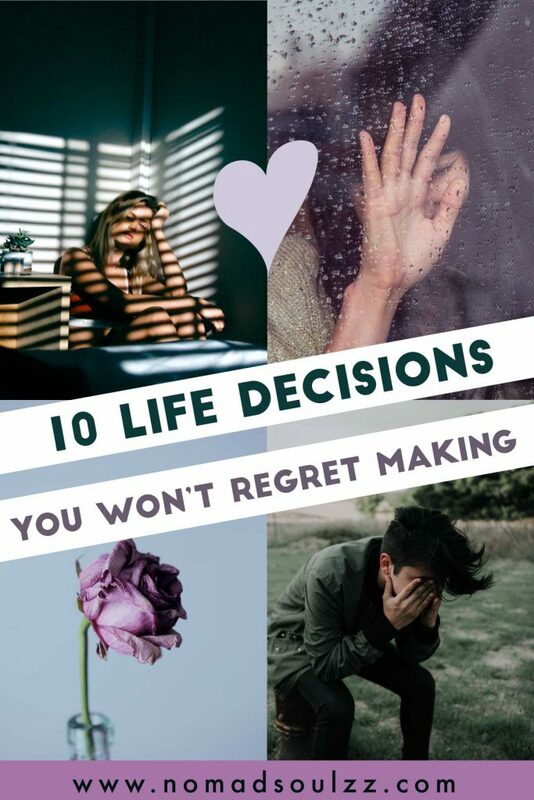 Do you agree that you won’t regret making these life decisions? Do you have any suggestions we can add to the list? Let us know in the comments below! If you enjoyed this post, we kindly ask you to share it with your friends. This helps to keep Nomadsoulzz running and creates the opportunity for us to continue creating content like this. We are eternally grateful for your support!